Inflatable military tent is made by very strong and durable 0.9mm PVC Tarpaulin material which make the military tent can be well used in very tough circumstance like desert or cold weather. 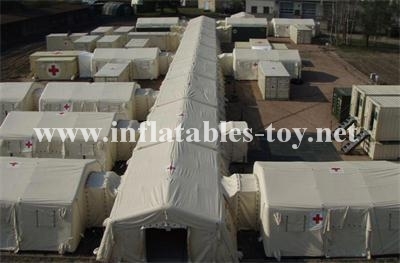 Inflatable army tent is supported by columns one by one and they share the same air chamber which made the army tent can be set up very quickly and also can be very light, different from the common inflatable tent which is made by double layers material. Inflatable military tactical tent is simple structured, high tensile strength, rigid, stable, wind resist, UV cut, water proof and so on. It can resist wind of 17m/s and can be well used from -35℃to +65℃. Inflatable military car tent is air-sealed style,once inflator can keep working for one to two weeks with any out power, very convenient and suit for any difficult environment of military. Also because if the lightness and small packing volume, military tent is very easy to be stored and moved around. Inflatable military tent is flexible as any other inflatable tent which can be made into any size suit for any number of people’s use. 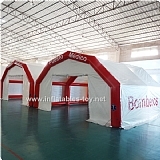 Also it can be separated into many small rooms for different use, and can be made to connect other tents. 1. Size: 9m*6m or Customer made.